The drumbeat for Joe Biden to jump into the 2016 presidential race is growing louder. Almost half of the nation’s Democrats want the vice president to enter the field and challenge front-runner Hillary Clinton, according to a new Reuters/Ipsos poll. The results come as speculation surrounding Biden’s intentions has intensified, with reports having him close to a decision. The declared Democratic presidential candidates, including Clinton and U.S. Senator Bernie Sanders of Vermont, her closest rival, will take the stage Tuesday night in Las Vegas for the first party debate. Biden will not be there, but 48 percent of Democrats surveyed in the Reuters poll wish he were a candidate, compared with 30 percent who said he should stay out. Independents were split on the question, with 36 percent saying Biden should stay in and an equal share believing otherwise. But support for Biden’s entry into the race does not translate into equal passion for his candidacy. Just 17 percent of those surveyed said Biden would be their first choice, while 46 percent would back Clinton. Biden would also run behind Sanders, who remains the favorite of one fourth of Democrats surveyed. Steve Schale, a Democratic strategist in Florida with Draft Biden, a political action committee established to lay the groundwork for a Biden run, said more voters would be likely to support Biden once he has officially launched a campaign. “There’s an element of people – they know they like him, but they’re not willing to give him their vote yet,” Schale said. Clinton has been perceived as increasingly politically vulnerable as questions persist over her use of a private email server while she was secretary of state in the Obama administration. 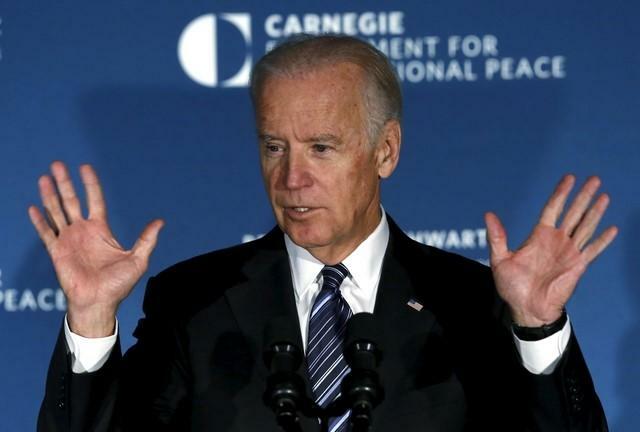 That controversy has helped stoke the fires for a late-in-the-game Biden shot. Even so, Clinton continues to command large organizational and financial advantages, as well as the lion’s share of the Democratic electorate, as the Reuters poll confirms. Media reports last week had aides to Biden consulting with the Democratic National Committee about upcoming deadlines for qualifying for state primary ballots. Several are as early as November, meaning that Biden will have to reach a decision soon or risk being left off the ballot in some primaries. The Reuters/Ipsos poll was conducted from Oct. 7-12 and surveyed 1,431 adults, including 580 self-identified Democrats. The credibility interval, which is similar to the margin of error, was 3 percent for the broader survey and 4.7 percent for the survey of Democrats.